Western Australia offers some of the best stargazing spots because of its remote location and very little light pollution. This is why many stargazers and astronomers from around the world make the journey here to get a better view of the stars and capture stunning images. Fortunately, you don't have to be an astronomer to stargaze as everyone can appreciate the night sky. You just need to be as far away as possible from light pollution. If you want to take a 250km drive you will be treated with spectacular views at The Pinnacles, located in the Nambung National Park. You can capture interesting images of a blanket of stars stretching above limestone structures. Under moonlight, the shapes of the Pinnacles cast wonderful shadows. This image belongs to the travel and nature stock photo library. 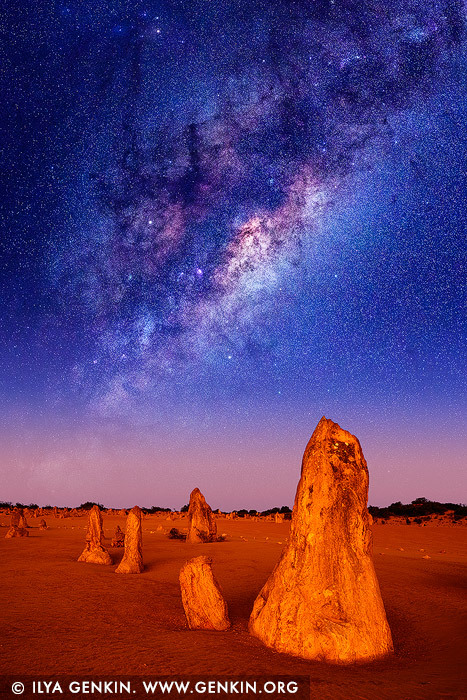 This stock photo of Starry Night in The Pinnacles Desert is available for licensing for commercial and editorial uses including websites, blogs, books, magazines, brochures and advertising. Restrictions may apply for images which contain third party copyrighted material or sensitive subjects. Photos of artwork are for editorial use only. This image id MILKY-WAY-STARRY-SKY-0003 of Starry Night in The Pinnacles Desert, is copyrighted © by Ilya Genkin. This is not a public domain image.